While I am a big fan of frequent activity during the week, for overall health purposes, I would never advise anyone to do 6 days a week of cardio in an attempt to lose bodyfat. And I would be even more reluctant to advise 6 days a week of traditional long and slow sessions of 45 minutes or more on the treadmill/cross trainer. However, unfortunately that type of advice seems to be rather very popular, and many trainers are actually the ones to blame for this. I remember when I had joined my first gym as a basic level trainer, there were these 2 other trainers who were competitive bodybuilders, and worked the same hours as mine. The gym was an upscale one, so more than 90% of the clients were after fat loss. And these two trainers, would always suggest all the traditional methods like, do 45-60 minutes of cardio 6 days a week, lift light weights for high reps, do not eat anything after 7 pm, etc. Of course these two guys were also very lazy, so it worked out well for them to ask someone to hop onto a cardio machine and work away, so that they could sit and relax while the client toiled hard. However at the end of the day, the clients never seemed to lose any real fat (except the initial 5 pounds or so of water weight), and they always seemed to be more beat up than healthy to me. And you can be rest assured that the drop out rates were also quite high. On the other hand, my clients would enjoy their sessions, and even after I left the place, some of them would call me up for program design, though I no longer worked there. The reason was that my programs were much more challenging, rewarding, and above all, gave results! Even though this was 2007-08, and I had not yet embraced the “do not train to failure” mindset, still my programs were of much lesser duration, and focused more on strength training, rather than slow and painfully boring cardio. Getting back to the topic, I am sure you probably know some friend or relative who trains at home, and brought a treadmill or cross trainer, with a lot of excitement, only for you to find out that 3-6 months later the machine became a place to hang clothes, since it was no longer used by its owner. And I can assure you that the reason for this is not just the fact that these machines become boring to use very soon, its also because they do not produce the “instant” fat loss results that are promised in many ads and by many trainers. Before I continue, let me state that I am not against the machines itself, I am more against the way it is commonly used. A treadmill in my opinion can provide good results, as I had used it in the gym to help clients get results. However I relied on intense interval cardio lasting 15-20 minutes rather than slow and steady pace cardio for 45 minutes. However, unfortunately for some reason most people first think of doing steady cardio on it, rather than doing effective intervals. And this is why these machines end up being ineffective. 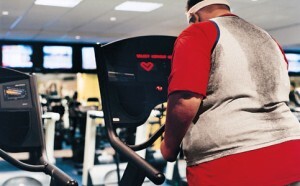 And lets not forget those who think that they do not need to watch what they eat, as long as they use these machines. Nothing can be further from the truth! Your diet is the number one factor that you need to dial in when trying to lose fat, if that is not set, then you can as well forget about losing more than the first few pounds of water weight. 1) Your body soon adapts and stops losing fat- while as a complete sedentary beginner, you may find that a 45 minute cardio session is much more than what you can handle, you will very soon get used to the pace, and get in a comfort zone. And once that happens, your body will no longer respond to the workouts. So even while you may spend 6 hours a week doing cardio, your body will no longer respond, as it just fails to challenge your now “used to it” body. 2) It causes muscle loss- while your goal is primarily fat loss, you still need to know that maintaining, and maybe even gaining some lean muscle is critical for your purposes. And such long cardio workouts raise cortisol levels in the body to the point where you start burning precious muscle tissue. And in case you did not know, then you should know that a pound of muscle burns upto 50 calories a day, so even a loss of 10 pounds of muscle (very common with excess cardio), can cause your body to burn 500 lesser calories a day. This would also mean that you have to drop your calorie intake very low to see the scale move, and very low calorie intake means even further muscle loss. Also loss of muscle muscle means that even if you lose some fair amount of bodyfat, you will still remain untoned, and now look “skinny-fat”, rather than lean. 3) Causes excess wear and tear on joints- a long cardio session causes a lot of wear and tear on your joints, and this could mean bad news for you after a few years of training. For eg, very recently a friend of mine in his mid 20’s, who was a national level rower and an avid long distance runner for many years, is now starting to experience some knee pain at his young age. Unfortunately in his case, there was also a lack of strength training, which could have helped to keep the knee relatively safe, but this lack of strength training is also very common with other cardio junkies too. And my friend is actually more on the underweight side, so think of the joint stress that the obese and overweight people put on their joints with long steady cardio! Now some of you who follow bodybuilding might ask, how come bodybuilders rely on steady state long duration cardio (sometimes even multiple times a day) to get ripped? First of all, do keep in mind that what bodybuidlers do to lose fat is only for a short period of time, like 8-12 weeks. Its not a year long thing that they do, and many of them don’t even do any cardio outside of the 8-12 weeks of pre-contest training phase. One of the reasons why bodybuilders rely of slow cardio is because of their diets. Considering that these guys have a ton of muscle mass (which most of us dont), and that they often eat less than 2000 calories a day when dieting, it is likely that with such few calories, a high intensity workout which relies on stored glycogen, could easily lead to muscle loss. Again, since it is done only for a short period of time and with a prize in mind, the extreme diet is somehow endured by the bodybuilders. You on the other hand will be doing this for a lifetime, and will not go back to eating all out after 3 months. What about light cardio for restoration and recovery on off days? If you like the idea of a light walk or run on your off days for restoration and feeling better, then I suggest go for it, as active recovery is better than lying on a couch for the whole day. However the key is to keep it light, and just get a slight sweat going, rather than try to hit something like a “runner’s high” in these off day workouts. Plus if you are really overweight with joint issues, then you want to keep your choice of activity as low impact as possible, like swimming or walking. So then how much cardio and strength training should you do in a week? This would be a bit hard to generalize, as everyone is different. However to some extent the suggestions that I had shared in this earlier post seems to work well for the majority. In the end I would like to conclude by saying that do not believe the myth that you need 6 days a week of cardio to lose fat, rather focus on an effective plan that works and will make you feel better, rather than feel like a hamster on a wheel.